Showing 42 articles from February 10, 2016. LOUISBURG -- The results of a federal probe into the death of a skydiver could be months away, but operators of the skydiving center where the incident occurred believe human error led to the death of an experienced jumper. Triangle Skydiving Center owner Greg Upper and Dawn Larson, an FAA parachute rigger, presented the county's airport commission Tuesday afternoon with their understanding of the accident that killed James Stremmel on Jan. 16. RALEIGH -- Police arrested a Louisburg man Tuesday, alleging he shot and killed a taxi driver. Raleigh police charged Major Earl Edwards Jr., 25, with murder and placed him in jail without bond. According to reports, police responded to an apartment complex before 1:30 a.m. Monday to find Jose Nicolas Dominguez, of Raleigh, suffering from a gunshot wound. He was pronounced dead at the scene. AT LEAST IT'S NOT FROZEN ... YET! After a very wet fall, 2016 has started out with plenty of rain as well, making scenes like this all too common. 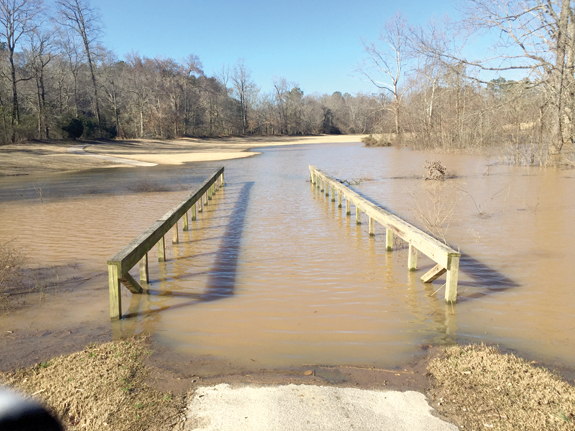 This photo was snapped at the approach to the tee box on the 12th hole at The River Golf Club in southern Franklin County -- and it looks like it's going to take a number of sunny, dry days to get things back to normal. Although this week has been quite chilly, what's predicted to be on the way this weekend is downright frigid! Temperatures are expected to drop into the teens, at least briefly, but more seasonable temperatures are expected early next week. LOUISBURG -- Although the regular business agenda was very light Monday night, the Franklin County Board of Education heard a lot about heavier topics. Long-time Franklin County educator Robert Taylor presented the school board with a copy of his daughter Tensie's first book on how she was bullied from kindergarten through 12th grade. The book's title is "Bullied: From Terror to Triumph" (My Survival Story). Taylor said he hoped some of the information contained in the book would be useful for school employees and school principals" to help curtail bullying. With its long-range strategic education plan in place, school officials are planning three community forums to acquaint the public with what Franklin County Schools have to offer. Superintendent Pascal Mubenga told the school board Monday night that the three forums will give school personnel time to highlight the strategic plans and then meet one-on-one with parents about education-related topics. A pre-primary Election Forum is being planned to give local candidates in contested races an opportunity to share their views on topics of local interest and importance. The forum is slated for 7 p.m. Monday, Feb. 29, in the Jones Performing Arts Center on the Louisburg College Campus. The moderator will be Dr. Kelvin Spragley, assistant professor of history and education at Louisburg College. 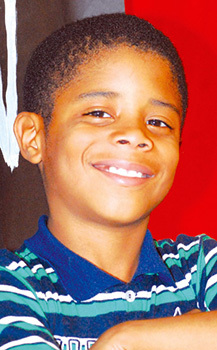 County resident David Smith, Jr. Compete with the state and you'll get stepped on! It's too bad that handwritten thank-you cards, carefully crafted and sincere, have fallen so far out of style. We're faced with one of those rare situations where a well-written, from the heart thank-you card to our beloved governor, Pat McCrory, and our lawyer-in-chief Roy Cooper, have been well-earned. It's also one of those rare times when the card could be entirely bipartisan since Gov. Mac is a staunch Republican and Lawyer Cooper is a noted Democrat who also happens to be running for the governor's office later this year. 'Carolina comeback' has a long way to go! One of the real treats of watching Sunday's coverage of the big game was learning about the "Carolina Comeback" that's allegedly happened somewhere other than on the gridiron field. Our governor, Pat McCrory, kicked off his re-election campaign over the weekend, touting the "Carolina Comeback" that he says proves the state's economy has gotten better and is on the right track. It may take the Peanuts Gang to get to the bottom of this. Because, if anyone can find out why people are winding up with a box of rocks instead of, let's just say, the X-Box you ordered, Charlie Brown is your man. Who can forget the classic, It's the Great Pumpkin, Charlie Brown, Peanuts special and the utter failure that Charlie Brown enjoyed that evening. As everyone else around him was getting all sorts of Halloween treats, poor Charlie Brown ended the night with a sack full of rocks. 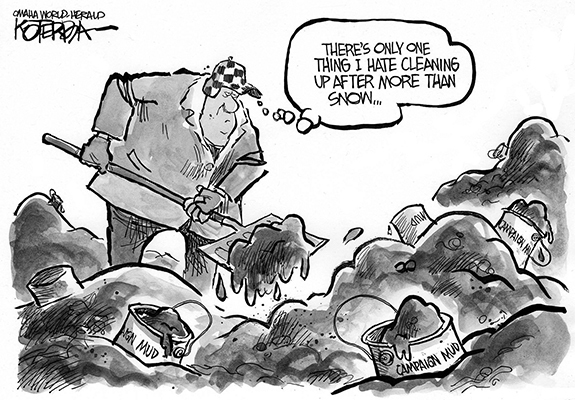 A week ago, the sanitized report on charter schools was released. The report was due a month before but was not released because Republican Lt. Gov. Dan Forest didn't think it portrayed charter schools in a good enough light. He "suggested" changes to the Office of Charter Schools Director Adam Levinson, who incorporated them into the final report, which goes to the NCGA. Levinson is a state employee, Forest is the lieutenant governor and the report can be used as justification (read: cover) by administration friendly legislators like State Sen. Chad Barefoot. Mr. Commissioner, tear down that fence! The safest position for a politician to take when questioned is to remain neutral; never answering a direct question. Sit on the fence, do not take a position, let all sides believe you stand with them. 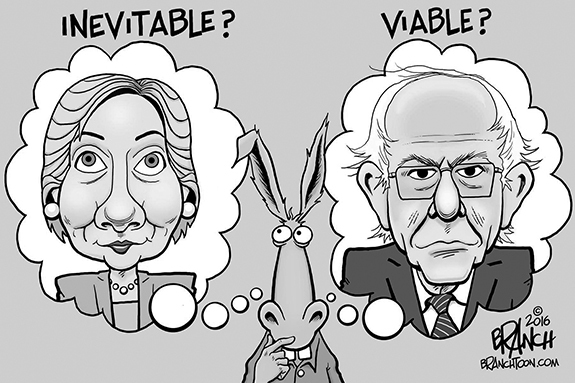 A seasoned incumbent once told me if you understand fences you will understand winning in politics. He said fences are used to control all manner of things. If strategically used with people you can keep them out of places, and cause them to go in any direction. LOUISBURG - Dianne Carol Southall, 53, of Louisburg passed away Monday, February 8, 2016, at her home. She was born on February 1, 1963 to Wilbur and Shirley May Southall. Dianne was tenderhearted, outgoing, creative and mechanically minded. She was passionate about animals and the outdoors. Her daddy was her best friend and her daughter, Leah, was her world. She was preceded in death by her nephew, Kyle Lewis. LOUISBURG - Funeral services for George Washington Walker Rogers, 59, who died Tuesday, Feb. 9, 2016, will be held at 2 p.m. Saturday, Feb. 13, at Richardson Funeral Home in Louisburg. Burial will follow in Oakwood Cemetery. LOUISBURG - Maggie W. Allen, 85, died Tuesday, Feb. 9, 2016 at Autumn Winds Assisted Living in Louisburg. Funeral services will be held Saturday, Feb. 13, at Alston Anderson Funeral Chapel in Louisburg. Burial will follow at St. Delight Church cemetery, Louisburg. LOUISBURG - Maurice Franklin "Joe" Carter, 74, died Tuesday, Feb. 9, 2016 at Wake Medical Center. The family will receive friends Saturday at 3 p.m. at Lancaster Funeral and Cremation Services Chapel, 804 N. Bickett Boulevard, Louisburg, where a memorial service will follow at 4 p.m., with Mr. Allen Tharrington officiating. FRANKLINTON - Michael Christopher Green, 22, of Franklinton, was called home to be with his heavenly father on February 7, 2016. Michael was a man with an easy smile and a kind heart to match, whose loving nature never failed to uplift those around him. Every person he met could feel his gentle spirit and his love for others. It never took long for someone to call him a friend. Always willing to lend a helping hand to anyone he met, Michael touched many lives during his time on this earth. 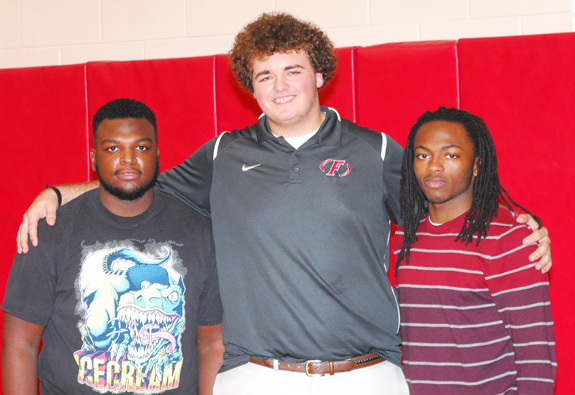 FRANKLIN COUNTY -- Teammates, adversaries and friends -- that's a brief summation of the relationship Tevin Perry, Tyler Dixon and Dillon Hopkins have enjoyed through the years. The trio grew up together and played on the same teams in multiple sports during their days in the Bunn Youth Recreation League. Hopkins and Perry would attend Bunn High School, but Dixon would end up at cross-county rival Franklinton. DUNK-A-THON. 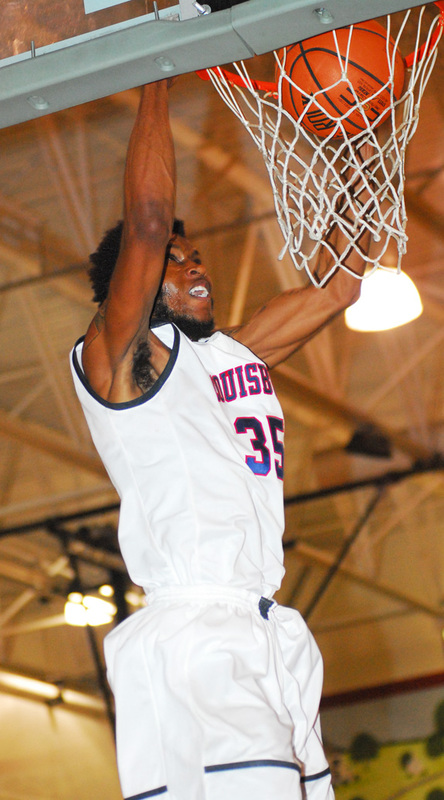 Louisburg College's Jakeem Yates sends down a slam against Guilford Tech CC. JAMESTOWN - While some coaches might be overjoyed at the thought of walking into a gymnasium and seeing only six opposing players, that's not the way Neil Dixon works. Dixon was a bit disheartened last Friday when his Louisburg College Hurricanes arrived at the Jamestown YMCA for a Region X showdown against long-time rival Guilford Tech. 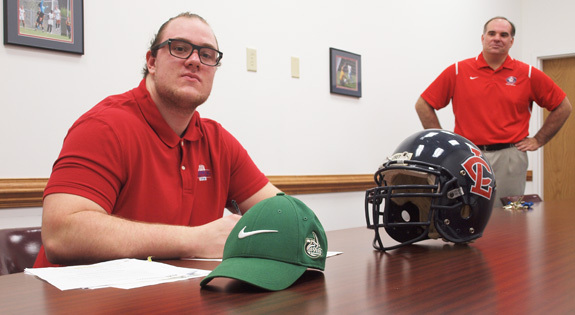 LOUISBURG -- Theoretically, Louisburg College's football program is of the two-year variety, but LC head coach Trevor Highfield considers his responsibility to incoming freshmen to be a four-year commitment. That's because Highfield, who just completed his first season as LC's skipper, accentuates that he wants all of his players to go on to compete at the four-year level. UP AND OVER. Franklinton's Delton Davis goes up for two points during last Wednesday's home decision against Bunn. FRANKLINTON -- Franklinton's quest toward the Northern Carolina Conference boys basketball championship didn't encounter much resistance last Wednesday from the Bunn Wildcats. Earlier in the season, FHS was taken to overtime at Bunn before coming through with a victory. Things were never close during the rematch, which went to the Red Rams in convincing fashion. IN THE CLUTCH. Bunn's Precious Walker (with ball) made several key plays down the stretch against Franklinton. 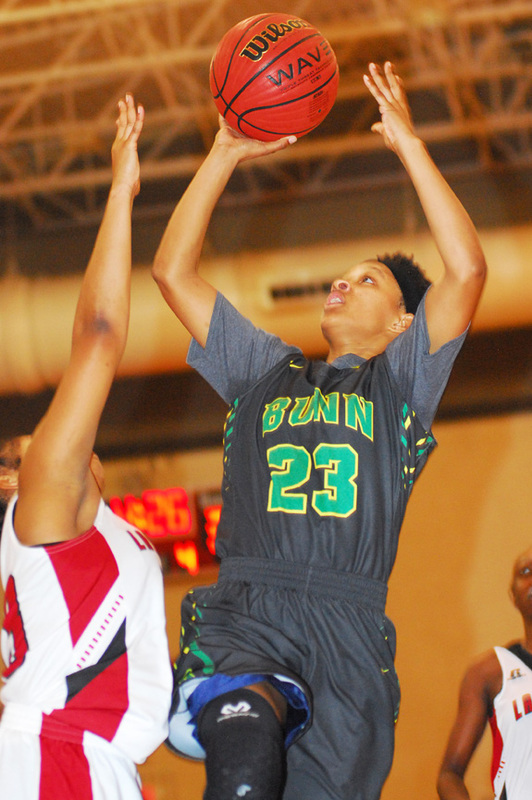 FRANKLINTON -- Still atop the Northern Carolina Conference and still almost unbeatable at home, the Bunn Ladycats have been tested on the road this season in NCC action. But the Ladycats continue to survive those tests, including a harrowing 50-42 triumph last Wednesday at Franklinton. Bunn, now 13-0 in league play, trailed 8-7 after one frame before exploding in the second stanza with a 14-0 spurt that was fueled by transition off half-court pressure defense. RALEIGH -- The Kerr-Vance Academy varsity boys basketball team fell to St. Thomas More in the first round of the Carolinas Independent Conference Tournament in Raleigh on Tuesday evening. Given that the conference is a mix of 1A and 2A teams, the Spartans, who finished as the third seeded 1A team, had to travel to Raleigh to face the second-seeded 2A team. FRANKLINTON -- Franklinton High School wrapped up the Northern Carolina Conference boys basketball championship on Tuesday in grand fashion. 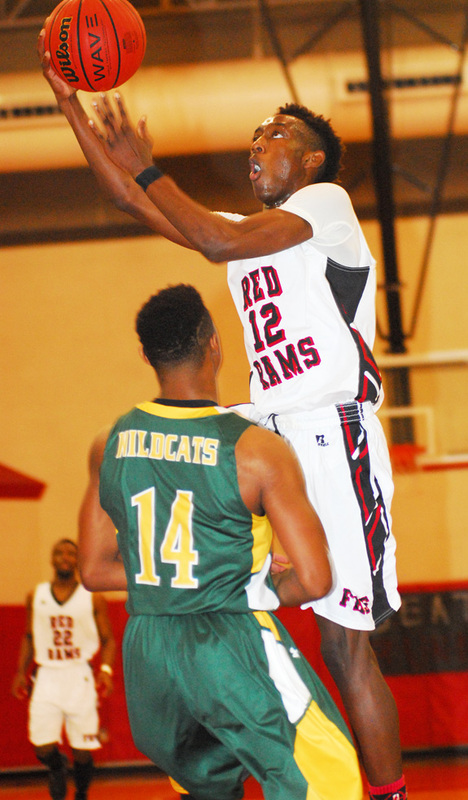 Playing at home, the Red Rams clinched their first league crown since 2006 with a strong 73-60 decision over Roanoke Rapids. As has been their custom lately, the Red Rams roared ahead early and took control to stay. Franklinton outscored the Yellow Jackets by a 22-13 total in the opening period of action. FRANKLIN COUNTY -- Rosters have been finalized for the Tar Heel State contingent at the upcoming 2016 North Carolina-South Carolina All-Star Basketball Games. The contests, which feature the top male and female seniors from North Carolina and South Carolina, will be played March 19 at Socastee High School near Myrtle Beach. 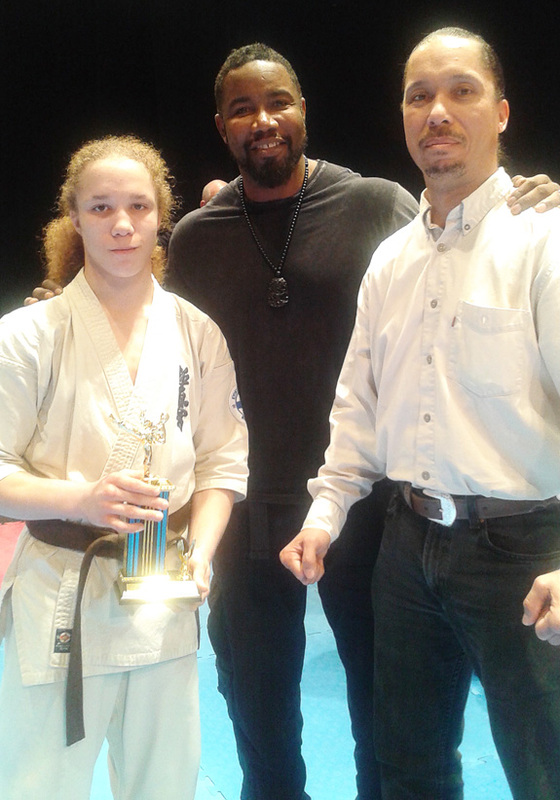 LOS ANGELES -- Christian Buffaloe, local 16-year-old Kyokushin competitor, recently gained 2nd Place in the Teen Division (16 yrs) of the "2016 Kyokushin U.S. Karate Championships" in Los Angeles. This prestigious yearly event is sponsored by the International Kyokushin Karate Organization in Tokyo, Japan, and features many top competitors from around the world. SUPPLY -- Louisburg College notched a key Region X women's basketball conquest last Saturday as the Lady Hurricanes edged host Brunswick Community College by a 76-71 tally in overtime. 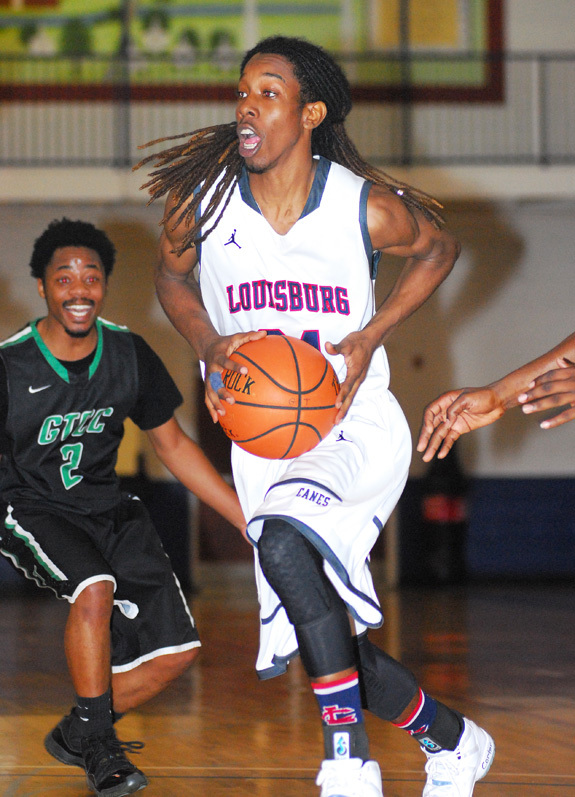 The matchup was tight throughout before Louisburg outscored BCC 14-9 in the extra session. Supersub Jasmine Covington came off the bench to spark Louisburg with 17 points, followed by Keechell Johnson with 16 markers. HENDERSON -- The Vance-Granville Community College Vanguards men's basketball team recorded a third Region X conference victory of the season on Feb. 1, beating the Titans of Guilford Tech Community College in Jamestown by a score of 98-76. The Vanguards built a 49-37 lead by halftime and followed that with an almost identical second-half score of 49-39 to dominate the home team. 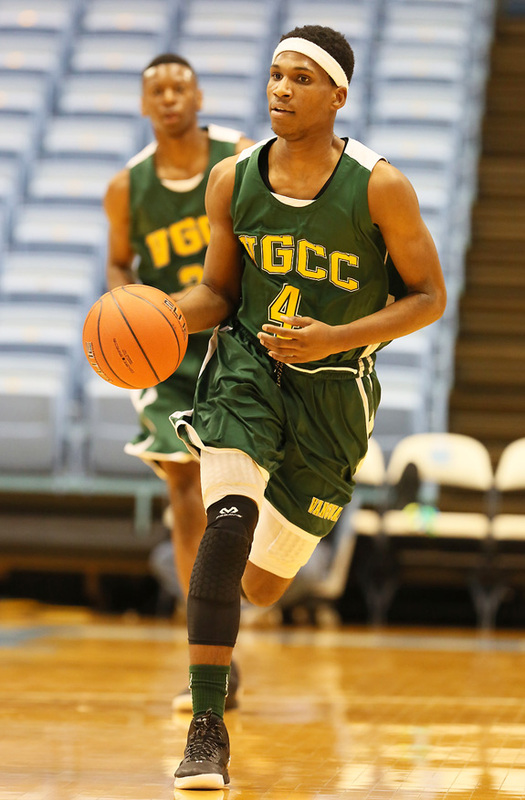 VGCC sophomore Alcyone Moore of Charlotte had the best game of his college career, leading his team in scoring with 35 points, going 6 for 6 from the free-throw line, and posting eight rebounds. 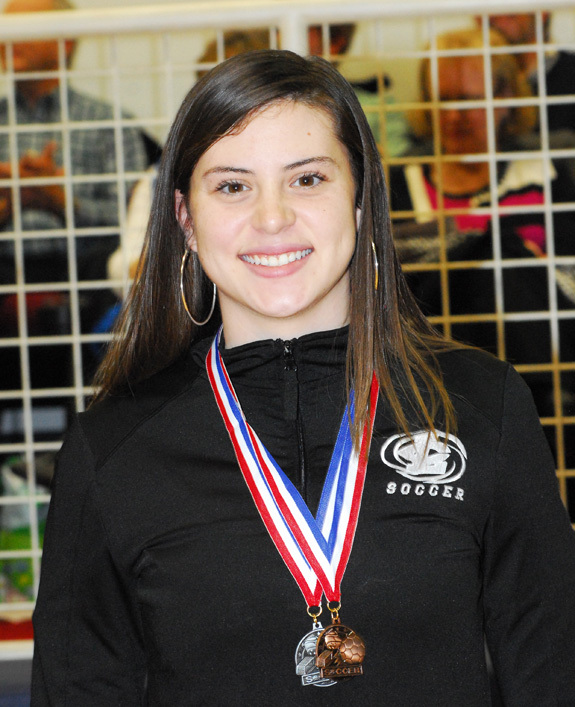 LOUISBURG -- When Andy Stokes first saw Abigail Ross play three years ago, he knew she displayed the talent and potential to be a high-level women's soccer keeper. Since then, Ross has continued that upward curve. After finishing up her prep career at Nash Central, Ross signed to play under Stokes at Louisburg College. Ross recently completed her two-year stint at Louisburg in successful fashion, but her career is far from done. Louisburg College's Jamal James (with ball) drives toward the basket during the Hurricanes' road basketball conquest last Saturday against region foe Guilford Tech. 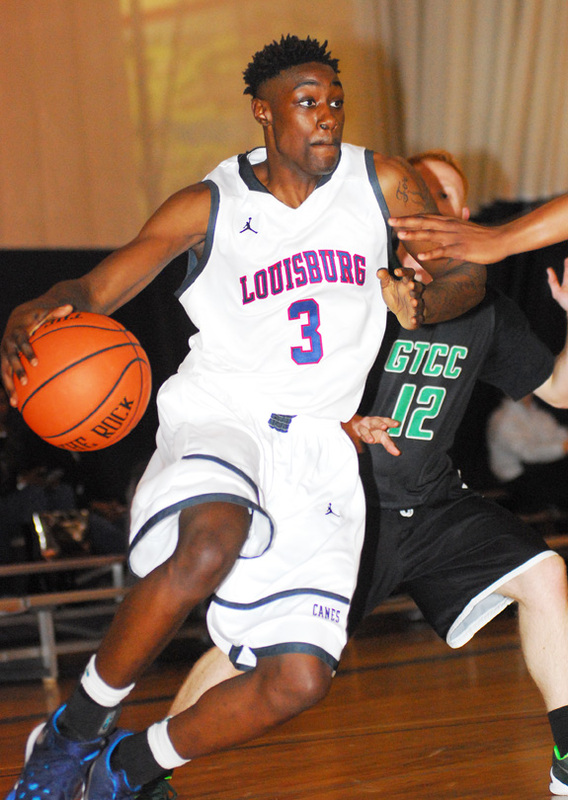 Louisburg College's C.J. Hill (with ball) makes a strong move along the baseline as part of his team's road victory over Guilford Tech. The first concert of the spring season at Cherry Hill will take place Feb. 21. 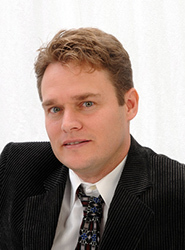 This initial performance of "A Celebration of the Piano" will feature Dr. Vincent van Gelder. Other pianists for the ongoing celebration will include Mayron Tsong in April, Andrew Willis and friends in May, and promising student pianists from East Carolina in June. 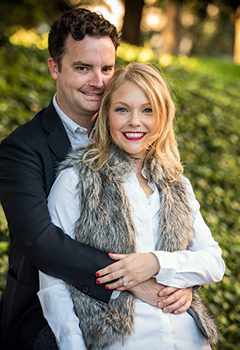 Mr. and Mrs. Howard Moore of Wake Forest announce the engagement of their daughter, Jessie, to Lance Pritchett, son of Norwood Pritchett and the late Ellen Pritchett. Ms. Moore is the granddaughter of Mr. and Mrs. Bennie Ray Gupton and the late Mr. and Mrs. Howard Linwood Moore, of Louisburg. An April wedding is planned. RALEIGH -- Two Franklin County teachers earned classroom grants from the North Carolina Farm Bureau. The Farm Bureau presented the Ag in the Classroom "Going Local" grants, valued at up to $500, to Youngsville Elementary teacher Lynn Hammer and Cedar Creek Middle teacher Cheryl Henry. "There is no more valuable resource in North Carolina than our students and the teachers charged with their education," said Larry Wooten, president of North Carolina Farm Bureau. FRANKLINTON -- A 22-year-old man was killed in a weekend wreck. It was the second wreck that Michael Christopher Green had been in on Sunday, investigators said. According to a report by Trooper C.M. Garner, Green was driving a Toyota pickup truck south on Peach Orchard Road just before 5 p.m. when he came out of a curve, traveled left of the center line and ran off the road to the left. KITTRELL -- Franklin County sheriff's deputies are looking for suspects in a shooting. 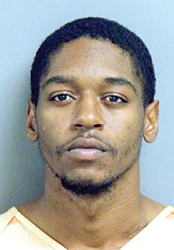 Authorities responded to a home in the 1000 block of Walter Grissom Road the afternoon of Feb. 1 to find Kwarshon R. White, 24, suffering from a gunshot wound to the foot. He was transported to Maria Parham where he was treated for non-life threatening injuries. The Franklin County Cooperative Extension hosted its 20th annual Equine Infectious Anemia (EIA) clinic on Feb. 6 at the Farmers Market Shelter in Louisburg. It was an opportunity for owners to have their horses vaccinated and subjected to a Coggins test, which detects antibodies to the EIA disease. 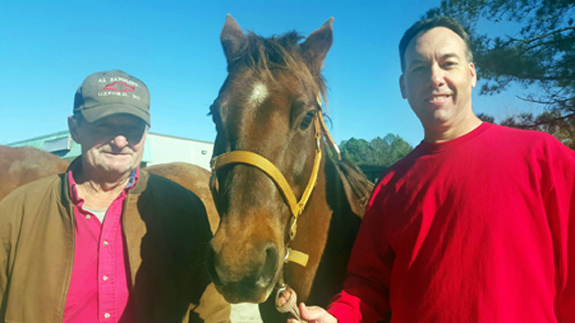 Southern States and Murphy Farm Feed & Hay donated free horse feed to the participants. The following Democratic Precincts will meet on Saturday, Feb. 27. Those not listed will meet on Saturday, March 12. LOUISBURG -- Franklin County's Solid Waste Task Force is looking to get a recycling program back off the scrap heap. Back in 2012, Franklin County was part of a pilot program with the State Department of Transportation and the Department of Corrections whereby inmates working road details not only picked up trash, but separated recyclables. The Task Force considered it a success and staff with the Department of Corrections said recycling didn't cause a significant workload or create extra time for the prison crews or prison staff. YOUNGSVILLE -- An online ratings and review site for senior care released its third annual Best of 2016 Awards and Franklin Manor was listed among the elite. SeniorAdvisor.com, touted as the largest such online rating site, announced its winners this week, placing the facilities amongst the top 1 percent of senior living and in-home care providers in the country and Canada. 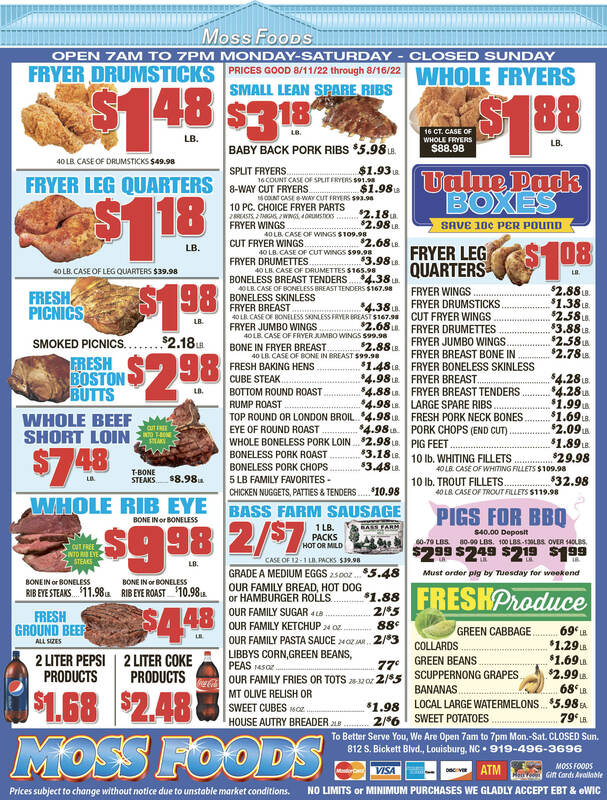 The Youngsville location was among the more than 1,000 winners recognized.